I have just spent two weeks trying to practice what is preached in one of the books my co-blogger Joan wrote about on Tuesday. Instead of talking about how cluttered my house is, I am finally doing something about it. It was intimidating for me to even think about starting to de-clutter my house. My loving husband gave me the book The Life Changing Magic of Tidying Up. HINT HINT. I am long past being annoyed when Jess gives me literature with a pointed message. I freely admit, I have acquired my mother’s genes of . . . acquiring. And never letting things go. So I read the book from cover to cover. I loved the glimpse into Japanese culture! (I wonder if I do have a 12 mat living area?) And then I decided to commit to de-cluttering for once and for all. After all, I love MAGIC! The good news, author Marie Kondo says once you do this “tidying” the right way, you will never have to do it again. The bad news? It takes a serious amount of time. After two weeks I am still not finished going through all the clothes in the house; I have not yet moved on to other categories. 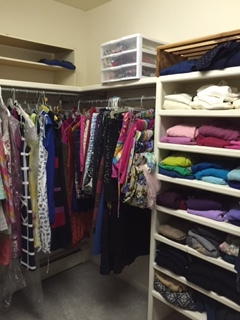 But I followed the tidying guru’s directions and took every last thing out of my closet. Even though I do seem to have an unusual emotional attachment to clothing, since I found some clothes I wore in high school, I started with shirts, as recommended. 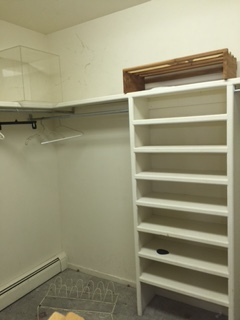 It was a bit more Grueling than Joyful, but I hung in there, and dumped all the clothes and other stuff from my closet in the middle of the floor. I picked up each item to see if it sparked joy, as instructed. I made the painful determination, item by item of whether or not to keep it. Luckily for me, my daughter Abigail was helping me. She seemed to think I was finding too much joy in my clothes and keeping too many things. Later in the week, my daughter Alicia joined us, and we pruned things from three closets at the same time. 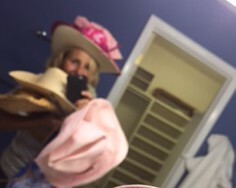 Maybe my daughters are right: how many hats can a person who doesn’t even like to wear them need? But many things I own spark great memories in me; I am attached emotionally. The brilliant thing about the Magic book was that for every reason I had why I wanted to hang on to every thing I have ever owned, Marie Kondo had a compelling reason why this stuff would serve me better if it was no longer in my house. I got really good at bowing and thanking my clothes for the joy they brought to me and then sending them forth! When I was done discarding, and had adequately thanked my clothes for serving me, there were explicit instructions as to how to organize the clothes that were remaining. Since my closet is made to different specifications from the average built-in Japanese closet, I had to interpret the directions as best I could. The results WERE MAGICAL. Not only did I no longer sneeze from dust when I entered my closet, but there was actually space on the floor and in between the hangers! I have boxes and bags of things to give away: most to charities like Attire for Hire, and a halfway house for kids pulled from bad home situations. But I admit, some of my stuff is going to a cousin who owns a vintage store, and also does costuming for movies. I only have two regrets when I look at my nice, clean, well organized closet:1) I should have given more stuff away — I can’t really find joy in ALL those things I kept, and 2) it sure is going to take a long time to clear out the rest of the house!